Homeport's Marisa Perez Searle and Ray George survey Milo-Grogan's Brittney Billingsley. Homeport has launched a summer-long quality of life survey of Milo-Grogan residents. The door-to-door, street-by-street Community Impact Measurement is a snapshot on topics ranging from safety, health and education to neighborliness and consistently of mail delivery. "Our goal is 200 responses but we are trying to get as many as we can get. Everyone's door will be knocked on at some point," Eddy said. Milo-Grogan residents who have not been approached and want to participate can contact AmeriCorp VISTA Marisa Perez Searle at marisa.searle@homeportohio.org. Popular Homeport Housing Advisor Kerrick Jackson was interviewed for prime time news break segments of Telemundo Columbus on June 18. Interviewing Jackson about Homeport and its homebuyer education classes was Flash Informativo host and station Vice President Luis Orozco. Click the YouTube above if you missed the interview. Homeport has received a $9,000 gift from Westfield Insurance Foundation and its Legacy of Caring program. The "Family Stability" grant will help Homeport resident families meet critical needs from food to furniture to after school care. Accepting the check on June 22 from Huntington Insurance Senior Vice President Michael Long were Homeport President & CEO Bruce Luecke and Homeport Senior Director of Resource Development Laverne Price. Huntington is an agency partner of Westfield Insurance Group and nominated Homeport for the grant. It is a first-time award to Homeport from Westfield Insurance Foundation. Helping Hands Board member Alice Porter assisting college-bound students. 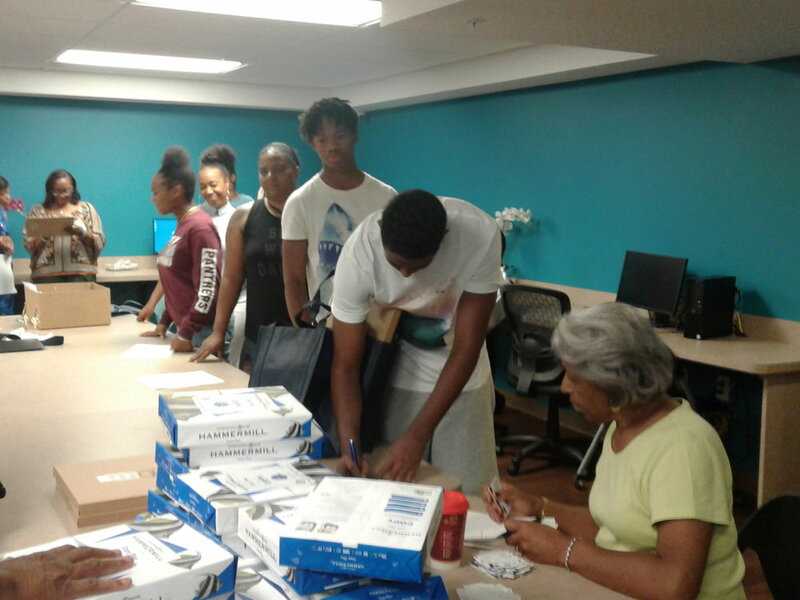 Longtime Homeport partner Greater Columbus Community Helping Hands was busy in June handing out scholastic and living supplies to recent high school graduates going off to college. Approximately 85 area children went through the college preparation initiative including three from Homeport communities. They received everything from computer laptops, printers, printing paper and ink, to mattress pads, comforters and pillows. 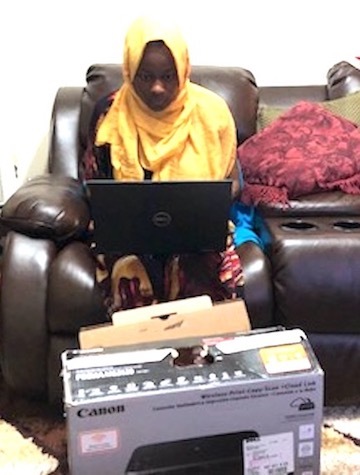 Among those who received the supplies was Mariian Ibrahim, a graduate of Central Crossing High School in Grove City. Ibrahim is seen here on the right testing out a new Dell laptop computer in Homeport's Bending Brook community. Mariian will begin Columbus State Community College in the fall with the goal of becoming a midwife nurse. Homeport Chief Financial Officer Valorie Schwarzmann was a presenter at the 2018 Consortium for Housing and Asset Management (CHAM) national conference held June 11-13 in Chicago. More than 315 individuals from more than 160 organizations across 36 states attended. Schwarzmann's PowerPoint presentation was entitled "What Makes A Good Asset Management Plan? Or How Do We Get the Data We Need to Create and Use One?" The presentation was part of an overall discussion on how to optimize/link real estate performance to the owner's financial position and long-range goals. Joining Schwarzmann on the panel was Harold Nassau, director of NeighborWorks America, and Amelia Hill, Vice President of Asset Management, Nuestra Comunidad Development Corporation, both from the Boston area. 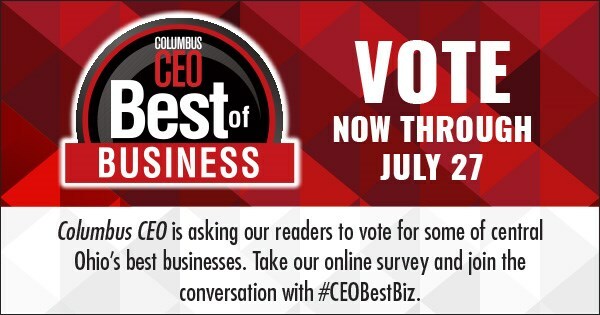 Click here and vote for Homeport in Columbus CEO magazine's Best of Business, large non-profit contest for Central Ohio. Large is defined as having an annual revenue exceeding $7 million. The on-line survey runs until July 27. Homeport is one of 14 contestants.